What do you remember about the Cathedral of Notre Dame? In the third of the Ten Commandments God instructs us to keep holy the Lord’s day. But what if that day coincides with an act of God of a certain kind, and one can’t get to church? Such is the case this weekend, when the Philadelphia region is expected to experience a blizzard with approximately a foot of snow driven by winds gusting up to 60 m.p.h. and visibility down to a quarter-mile. Forecasters say the snow will start falling Friday night and continue into Saturday night. 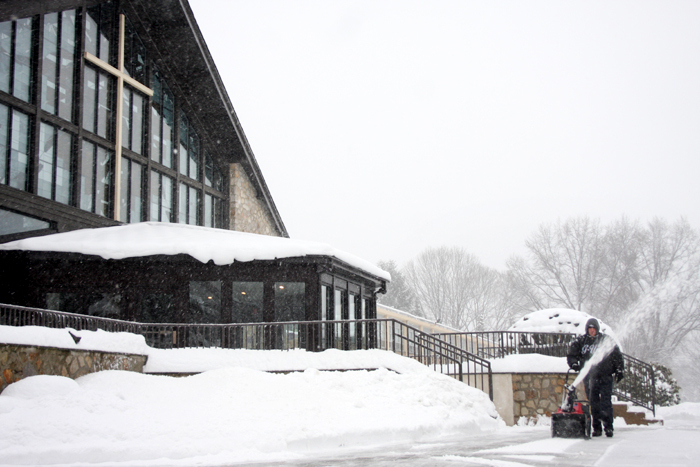 Vigil Masses on Saturday evening will be most directly affected, but so will Sunday morning Masses as the big dig out continues. According to Accuweather, a blizzard warning has been posted until 10 a.m. Sunday, Jan. 24 for much of the region including Delaware County, Eastern Chester County, Eastern Montgomery County, Lower Bucks County and Philadelphia. For this reason the Archdiocese of Philadelphia’s Office for Divine Worship advises Catholics of all ages and especially the elderly “to use extreme caution when making the decision about attending Mass” this weekend, according to a statement posted on the archdiocese’s website, archphila.org. Catholics who decide to stay home are invited to watch the Mass on television if possible — see the Mass schedules for EWTN and Catholic TV , or watch the Archdiocese of Philadelphia’s Mass at 5:30 a.m. Sunday on Channel 6. The faithful may also read the readings for the Third Sunday in Ordinary Time (see them here), or pray the rosary or other devotional prayers “to keep in a fitting way the Lord’s day,” according to the statement. Watched mass on EWTN at 8:00 am while snow was coming down. If neighborhood churches weren’t closed, people could walk to Mass, Now most people are forced to drive to church.